This just in from Palestine Chronicle . Please support Palestine Chronicle financially, if possible. \"They forced Yasser to take off all his clothes including his underwear.they ordered him to walk like a dog and then he burst into tears ..\"
OCCUPIED JERUSALEM (PC) - On Monday, November 25, Israeli soldiers ordered a young resident of the town of Nablus to strip completely naked in the street, according to Palestinian witnesses. Yasser Sharar, 25, was caught violating the curfew in Nablus and was stopped by Israeli soldiers at gunpoint, who immediately ordered him to remove his clothes. In an interview with Reuters, a witness explained, "They forced Yasser to take off all his clothes including his underwear.they ordered him to walk like a dog and then he burst into tears,"
The eyewitness who watched the scene from a few meters away continued, "He kept crying and was in a very stressful situation.many residents, including women watched him and he was very embarrassed." Israeli soldiers refuted the claim, saying that they merely asked him to lift his shirt, but he voluntarily removed all his clothing to get media attention. The Reuters report also claimed that this is the first time Israeli soldiers have ordered Palestinians to completely strip naked publicly in a security operation. However, recent interviews conducted by the Palestine Chronicle with scores of residents of the Jenin refugee camp contradicted the Reuters claim. Dozens of residents of the refugee camp claimed that during the Israeli invasion of April, 2002, it was a common practice to force residents to strip naked as a form of humiliation, or as the Israelis say, a "security operation." Na'el Ammar, 43, is a resident of the Jenin refugee camp and explains how Israeli soldiers arrested and detained scores of men from the refugee camp, and forced many to strip naked, " We were mostly older people, sick and wounded. We had nine handicapped people with us, three were from the same family, sons of Abu Ibrahim. Some of us were too old, they were senile. When they told them "go left" they would go right, but they stripped them naked anyway. I tried to help them as much as I could. I was the only one who spoke Hebrew.Close to us was a group of young men. They were handcuffed, naked and lying on their stomachs. The Israeli tanks would pass by them so fast, only forty centimeters away from their heads." Nawal Hawashin, a mother of eight, told Palestine Chronicle reporters that they threatened her 18 year old son with death if he did not follow their orders to strip naked, "They ordered my son and other young men to take off all their clothes and throw them on the ground. The soldiers warned that if the boys made any move, they would be shot. Near the Sahah, there was a body of a man with a white beard. He was lying dead on the ground, and tanks were rolling right over him. I couldn't recognize him. My son Mohammed said, "Mother, I am too ashamed to take my clothes off in front of women." I told him, 'Son, this is our fate." Jamal Hussein has a family of thirteen. A man who worked as a cheap laborer in Israel before the invasion of Jenin described in detail how terrified Jenin residents were gathered in the center of the camp and forced to undress, "Soldiers stationed on the top of a nearby house started throwing dirt on us.. We remained 15 men and boys. Half an hour later a tank came and stood near us. They pointed the canon at us. And they spent over an hour terrifying us that way. The commander of that unit spoke in Arabic to us, "Go to Saha". While we were on our way, we kept reading Koran. We felt that they were going to execute us. Once we arrived there, we found a large number of men, forced to strip completely naked. There was a big pile of clothes. Soldiers started shooting right above our heads, they would call on us, one by one. Once they pointed at you, you would have to pull your pants down and your shirt up, when it was my turn, as I stood up, I noticed the body of a man, Jamal Sab! bagh. It was some sort of a test. If you pass, you are arrested and if you don't, they'll shoot and kill you." According to Jenin residents, Israeli forces were not discriminatory in their aggression, young men, old and disabled were targeted. 45-year old Um Siri lamented how her son was not only forced to strip naked, but how he was later used as a human shield, "Then they took my son, they had him strip naked, and they also started firing between his legs to terrorize him." Israeli soldiers arrested and detained Um Siri's son for days, during this time, she did not know if he was dead or alive. Finally she found him in a rescue shelter where he recounted how he was treated, "When I also found my son, he told me that the soldiers took him to a field near the camp with many other young men, he told me that the soldiers had them walk in front of the tanks, as they were looking for fighters." The vulnerable and elderly, according to residents, were treated just as mercilessly. Um Siri recounted how the women of Jenin tried to come to the aid of some men, forced to stand naked publicly, in the pouring rain, "We passed by the sons of Sheikh Abdel Salam. They were standing there in the rain, after the Israelis had them strip completely naked. There was a woman who came with us. She took her headscarf and tore it to several pieces and gave it to the young men to cover themselves. A very thin old man approached while screaming, 'My sons, my money, for God's sake, they took everything!' The Israelis had him strip naked like the day he was born. Once the women saw that, they started pulling their hair, hitting their heads, and wailing. He has all of his life's savings with him, because he was worried that he might lose it in the invasion, but when the Israelis stripped him naked, they found the money and took it." Other residents described how young men were stripped naked and then shot. Yusuf Shalabi, a young man from the camp explained how the Israeli soldiers denied medical treatment to the wounded, ".I remember this nightmare very well. It is very difficult to talk about it. I remember them stripping the people naked, they would handcuff them and blindfold them. I remember seeing two wounded men, one was wounded in the shoulder and the other in the leg. They were screaming in pain and the soldiers would not allow them to be treated. The Israeli army, who according to Amnesty International committed war crimes in Jenin in April of 2002, targeted medical workers as well. They also forced the women to remove their head scarves. Seham Shalabi, a young woman who works in a textile factory in Jenin recounted her memories of those days last April, "An army jeep came and started circling the house, then it opened fire at us. Why would they open fire at us? Then they came and they searched us, and had us walk two by two, out of the camp. Just as we began moving, we saw another group of tanks and bulldozers. We found some doctors and medical workers, forced strip naked, handcuffed. Then they put them in trucks and took them to the Salem detention center. The Israelis started shouting and ordering us to take off our head scarves. Humiliation of medial workers was not only reported by the residents of Jenin, but these events were also narrated by the medical workers themselves. Mohammed Rafi' the director of the Red Crescent Society's youth development programs in Jenin recounted how the Israelis held medical workers hostage in the Jenin hospital for days, and then forced them to strip naked as well. "They did not allow anyone in or out. If one of us wanted to leave to the hospital across the street, it would take two hours of telephone calls and deliberation. Ambulance drivers would be forced to wait for two hours with people bleeding inside before they were allowed entry to the hospital, they would take our volunteers or drivers, have them stripped naked, and interrogated and insulted. Of the scores upon scores of interviews conducted by Palestine Chronicle reporters in the Jenin refugee camp, that act of forcing civilians to strip naked was reported time and again. The Israeli army has defended the action, saying that such tactics are necessary to assure that Palestinians are not carrying explosives. -(Palestine Chronicle (palestinechronicle.com). Redistributed via Press International News Agency (PINA)). I really like Webshots and highly recommend it. It is really FUN to visit Webshots every day and pick out new photos for our Desktop. The software is free and ingenious. Each day, an icon blinks on my toolbar alerting me that I can visit Webshots for more FREE photos for download. The program helps me manage all of the photos and I can even set the time that I would like to be notified. The kids love picking out new photos each day. What a saintly man to uplift us all with his courage in the face of trying circumstances. Bishop Michael Francis of Liberia speaks out about the five slain nuns in Liberia. The government's response? 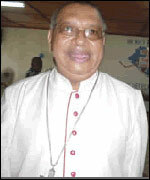 Accuse Bishop Francis and the Church of the crime. God bless you, Bishop Michael Francis. Do you see, my children, except God, nothing is solid--nothing, nothing! If it is life, it passes away; if it is a fortune, it crumbles away; if it is health, it is destroyed; if it is reputation, it is attacked. We are scattered like the wind. . . . Everything is passing away full speed, everything is going to ruin. O God! O God! how much those are to be pitied, then, who set their hearts on all these things! They set their hearts on them because they love themselves too much; but they do not love themselves with a reasonable love-they love themselves with a love that seeks themselves and the world, that seeks creatures more than God. That is the reason why they are never satisfied, never quiet; they are always uneasy, always tormented, always upset. See, my children, the good Christian runs his course in this world mounted on a fine triumphal chariot; this chariot is borne by angels, and conducted by Our Lord Himself, while the poor sinner is harnessed to the chariot of this life, and the devil who drives it forces him to go on with great strokes of the whip. The Lighthouse has been updated!!!! Thanks to my 4.200 visitors (this year)!!!!! Special thanks to my loyal visitors who keep coming back. Believe it or not, I have added a few games to the site, mostly because I didn't know how to add games to a website and I wanted to learn how. (Please send any complaints to the game designers themselves.) I'm not sure what my future plans are for the site as my number ONE priority is my family ---- AND we are a homeschooling family, so the website is waaaaay on the back burner for me, folks, but I certainly do HOPE to have time to add more features soon. Keep checking back. As always, if you have any questions about the Catholic faith, please send me an email. THIS JUST IN from my favorite Catholic commentator, Kelly Clark (a.k.a. The Lady in the Pew). that my dinner got ruined last night, got me to thinking about how many of us celebrate the Mass. If that seems like convoluted thinking to you, why not confirm it for yourself? Wander over to http://www.pewlady.com and see if I'm dealing with a full deck or not...I'd appreciate it! Hans von Sponeck is a German citizen who was the UN humanitarian aid coordinator for Iraq from 1998-2000 Follow his trail for some fascinating information about the situation in Iraq. Amazon denies backing Israel -- demands that Jerusalem Post remove Amazon ad. On November 16, Colin Powell, U.S. Secretary of State, issued this statement. It reads in part: "The United States condemns in the strongest possible terms the shocking and reprehensible attack on Jewish worshipers on Friday. The fact that these worshipers and Israeli security personnel who came to their rescue were gunned down on the way back from Sabbath prayers only adds to the horror of this attack." Since then it has been revealed that Israeli officials lied about worshippers being killed on their way back from prayer. In fact, the 12 men killed were soldiers, border patrolmen or armed settlers. No unarmed civilians were killed or wounded. 1) Hebron is not in Israel. The city is recognized by the United States and the international community as being under an illegal Israeli military occupation. Secretary Powell himself has called on several occasions for an end to the occupation. 2) Israeli military officials have admitted that no unarmed civilian worshippers were killed or wounded. The 12 men killed and the 15 wounded were soldiers, border patrolmen or armed settlers. 3) Finally, encourage Secretary Powell to demonstrate that the United States places equal value on all human life. It is inappropriate for the United States to only condemn the deaths of Israeli civilians while remaining silent as Palestinian civilians are killed on a daily basis. Amiens Cathedral Project An AMAZING FIND! I really enjoyed this website about the Amiens Cathedral Project, Notre Dame Cathedral, Amiens, France. You can take a Quicktime tour through the cathedral, view photographs at different angles, read texts about the project, drawings which will awaken budding engineers to GREATNESS, perhaps, a discussion forum and more. If you love Catholic cathedrals of old, you must visit this site to see how the beauty of the cathedral can be brought in interactive form to a worldwide audience via the internet. Awesome. The computer graphics section may seem rather campy, but truly, these images give you a greater sense of the lines in the architecture which are sometimes unseen in conventional photographic images, so these are to be appreciated, as well. Goldberg File, by Jonah Goldberg, NRO -- Morning in America: What’s next? I saw Tom Daschle on TV this morning. He had the same expression on his face my dog makes when he sees me scrape meat off my plate into the garbage instead of into his food bowl. Rod Dreher, NRO -- Damned If You Do: Historians dare to criticize Islamic dhimmitude at Georgetown and pay a price. Israel faces third year of recession ....even as Sharon wants to use U.S. funds to pay Jewish settlers to occupy land in violation of international law? What a crazy world. A deputy district attorney was suspended after his handling of a sexual battery case came under scrutiny by Utah detectives investigating the disappearance of 14-year-old Elizabeth Smart. Real or fake, dog tags stir up emotions -- The American government says more GI dog tags are coming back from Vietnam, and most of them are fake, produced for unsuspecting tourists by entrepreneurs who recognize their emotional and monetary value. Injectible contraceptive being recalled One more example of contraception leading to abortion. Inside The Womb -- You have to see this to believe it. Beautiful!! Hats off to Time magazine for this report. The Bipolar Spectrum Diagnostic Scale -- a self-reporting questionnaire helps minimize chance of misdiagnosis. Silent Suffering -- Enduring the Pain of Mental Illness for Jesus Christ Read it at TCR News. you, and will curse your blessings, yea I will curse them, because you have not laid it to heart. But you have departed out of the way, and have caused many to stumble at the law: you have made void the covenant of Levi, saith the Lord of hosts. Therefore have I also made you contemptible, and base before all people, as you have not kept my ways, and have accepted persons in the law. Have we not all one father? hath not one God created us? why then doth every one of us despise his brother, violating the covenant of our fathers? nor in wonderful things above me. so reward in my soul. ceasing: because, that when you had received of us the word of the hearing of God, you received it not as the word of men, but (as it is indeed) the word of God, who worketh in you that have believed. Then Jesus spoke to the multitudes and to his disciples, Saying: The scribes and the Pharisees have sitten on the chair of Moses. All things therefore whatsoever they shall say to you, observe and do: but according to their works do ye not. For they say, and do not. For they bind heavy and insupportable burdens and lay them on men's shoulders: but with a finger of their own they will not move them. And all their works they do for to be seen of men. For they make their phylacteries broad and enlarge their fringes. And they love the first places at feasts and the first chairs in the synagogues, And salutations in the market place, and to be called by men, Rabbi. But be not you called Rabbi. For one is your master: and all you are brethren. And call none your father upon earth; for one is your father, who is in heaven. Neither be ye called masters: for one is your master, Christ. He that is the greatest among you shall be your servant. And whosoever shall exalt himself shall be humbled: and he that shall humble himself shall be exalted. The readings of this Sunday are a lesson to us in humility and of thanksgiving to God for His faithfulness -- a reminder to us that without God we are nothing, but with God we are everything. The priests in the reading from the book of Malachi were merely going through the motions of service to God. Their sacrifices were not pleasing because their offerings were blind and lame sheep rather than the best of the flock. It is clear that the hearts of the people were not turned to God because they did not see the necessity of honoring God. They placed God in the position of subservience to themselves by sharing with Him the weakest of the flock. They did not believe they needed Him, so the faithful relationship with Him became faithless and forgotten in their hearts. In going through the motions of their faith, they made void the contract. They willingly separated themselves from our faithful and loving God. in it. Participation in the life that God wills for us requires our humility. Our humility is an act of giving -- an act of sacrifice -- and when we give of ourselves this pleasing sacrifice we receive back from Him the promised life. Those sacrifices made in our bodies, our minds and hearts, we bring with us to the altar. Without humility, full participation in a life with God is impossible because our sacrifices are meager and flawed, at best, like the blind and lame sheep. In pride, we hold back the best for ourselves and give to God the weakest portion. We've learned from the examples of the saints that a life of humility is very difficult, but in today's Psalm we hear of the reward of humility. The reward in this life is the hope in our hearts that we will be fully united with God. This hope and its realization is the fullest happiness which we may attain in this life. If we live our lives in a state of forgetfulness about our relationship with God, we may have a false sense of happiness, but there will be an emptiness within us still -- hopelessness. In God alone is true hope and salvation. He responds to our faithfulness as the truest of spouses. He will never turn from us when our humble hearts seek Him. He is faithful to the covenant, so we have reason to hope in Him. St. Paul risked his life to preach the Gospel to the Thessalonians. Eventually, he was martyred for his ministry. There is no greater act of humility than martyrdom. In martyrdom, one gives the utmost he has to give from his store -- his very life. Paul was not only humble before God, though. He was humble before those he ministered to, becoming a "little one" in their midst. It is not enough to stand in awe of the greatness of God. We must also be humble toward one another, no matter our station in life. If we do not practice humility toward others, we cannot truly be humble in the eyes of God. ministered to. The term he uses for this desire has the meaning of "yearning" or "longing" as the spouse longs affectionately for her husband. This is the humility which comes from the love of a holy priest for his congregation and it is an example to us of the depth of humility we must have toward each other. It is humility that Christ speaks of in the Gospel, and not only the humility of the priests but also of the laity. It can be difficult to show humility when we are in subjection to a priest if that priest has no humility or has fallen into some other great sin. Christ commanded that the people should do what the priests tell them to do because they sit on the "seat of Moses", a traditional term for the authority of the office. Christ is not abolishing the priesthood by saying that we should call no man "father". To the contrary, in our service to God, Christ commands that we are to be in a certain manner of subjection to the priests who have authority over us. He is teaching that it is in humility that we respect the office of the priest since his authority comes from God. When the priests do not live holy lives, however, we should not mimic them and we should not respect their sinful deeds in our hearts. We should do the will of God always, even when those in authority over us do not. It is not an act of humility to endorse or otherwise accept the sins of another. True humility is in seeing the good in others despite their sins, and seeing the sins in ourselves which others do not have. In a healthy understanding of humility, the distinction between good and evil remains clear. Other Scriptures about pride and humility. find rest to your souls. wise in your own conceits. But he giveth greater grace. Wherefore he saith: God resisteth the proud and giveth grace to the humble. another: for God resisteth the proud, but to the humble he giveth grace. The Concept of Humility in the Writings of St. Therese of Lisieux, by Marcel Dube, O. Carm. >From the fear of being humiliated, Deliver me, Jesus. >From the fear of being despised, Deliver me, Jesus. >From the fear of suffering rebukes, Deliver me, Jesus. >From the fear of being calumniated, Deliver me, Jesus. >From the fear of being forgotten, Deliver me, Jesus. >From the fear of being ridiculed, Deliver me, Jesus. >From the fear of being wronged, Deliver me, Jesus. >From the fear of being suspected, Deliver me, Jesus. Imprimatur: + James A. McNulty - Bishop of Paterson, N.J.
Find out your Congressman's voting record on life issues. NARAL even has a state-by-state report card on access to abortion. HAHA. My home state of Kentucky got an F!! What great news! Check your state! Silence: The sin of omission by Fr. Denis O'Brien, M.M. MEANWHILE, NARAL has declared a state of emergency with the loss of Sen. Wellstone. According to NARAL the Senate is on the verge of being won by a pro-life majority. I can hardly wait for election day so that I can go vote pro-life for everything from U.S. Senate to dogcatcher. Did you know that October was National Family Sexuality Education Month courtesy of Planned Parenthood, the largest abortion providers in America? Darn. I missed it. Oh well, there's always next year. wraps gently 'round my heart in layers kind. Whispers softly. Whispers, "I am here". Underneath and round the layers fold. Mind, inside, I hide. I'm lost. I'm cold. Whisper softly, "Mind cannot be bold." Heart so bold it cries, it cries to all. Mind so cold, its bitter daggers fall. Whisper softly. Whisper. Let me hear. Heaven's sunlight, clear and white and plain. Bitter daggers fallen still remain. Leap, my heart. Cry and let me hear. Whisper softly. Whisper. Heaven's near. Prayers are needed for Boston Carreon, a little boy who had surgery this evening after swallowing a penny. of kings, and to open the doors before him, and the gates shall not be shut. be feared above all gods. in God the Father and in the Lord Jesus Christ. men we have been among you for your sakes. insnare him in his speech. tribute to Caesar, or not? (Mat 22:19) Shew me the coin of the tribute. And they offered him a penny. (Mat 22:20) And Jesus saith to them: Whose image and inscription is this? to the fundamental rights of persons or the teachings of the Gospel. Sorry no blogging for a while, and perhaps not for some time to come. I have been hanging out HERE because the discussion has been so enlightening, and HERE because the discussion has been so uncanny. As I'm looking in my history folder, I see the sock smell-o-meter. I'm going to have to have a talk with my son. He was supposed to be doing something educational while he was on here. Or could that be my husband's file? Hmmmm. I've been HERE getting coloring pages for my preschoolers and HERE reading about Augustine's thoughts on the Eucharist (and Baptists say he was Baptist???). My son and I were reading about Spanish Exploration in the Americas (coolorama), and I was HERE reading about inclusive language in Bible translations. I was only on this page about dissecting the eye of a cow two seconds. ICK. Must run. I'll return when I can. This Worldwide Caution Public Announcement supersedes the Worldwide Caution Public Announcement dated September 9, 2002. In light of the recent audio tape attributed to Usama bin Laden and other reports of threats to American interests, this Worldwide Caution is being issued to alert Americans to the need to remain vigilant and to remind them of the continuing threat of terrorist actions that may target civilians. This Worldwide Caution expires on April 8, 2003. The U.S. Government continues to receive credible indications that extremist groups and individuals are planning additional terrorist actions against U.S. interests. Such actions may include, but are not limited to, suicide operations. Because security and security awareness have been elevated within the U.S, the terrorists may target U.S. interests overseas. We remind American citizens to remain vigilant with regard to their personal security and to exercise caution. Terrorist groups do not distinguish between official and civilian targets. Attacks on places of worship and schools, and the murders of private American citizens, demonstrate that as security is increased at official U.S. facilities, terrorists and their sympathizers will seek softer targets. These may include facilities where Americans are generally known to congregate or visit, such as clubs, restaurants, places of worship, schools or outdoor recreation events. Americans should increase their security awareness when they are at such locations, avoid them, or switch to other locations where Americans in large numbers generally do not congregate. American citizens may be targeted for kidnapping or assassination. U.S. Government facilities worldwide remain at a heightened state of alert. These facilities may temporarily close or suspend public services from time to time to review their security posture and ensure its adequacy. In those instances, U.S. Embassies and Consulates will make every effort to provide emergency services to American citizens. Americans are urged to monitor the local news and maintain contact with the nearest American Embassy or Consulate. As the Department continues to develop information on any potential security threats to Americans overseas, it shares credible threat information through its Consular Information Program documents, available on the Internet at http://travel.state.gov. In addition to information on the Internet, U.S. travelers can hear recorded information by calling the Department of State in Washington, D.C. at 202-647-5225 from their touch-tone telephone, or receive information by automated telefax by dialing 202-647-3000 from their fax machine. The Holy See has despite grave difficulties constantly manifested deep interest and concern in “non-arians.” This is quite clear from the recent action taken in favor of the Jewish youths and infants interned in Slovackia to prevent their removal from that Republic. Although the Holy See is deeply interested in the welfare of these children, it seems opportune to recall at this time of general question of the “Hebrew Home” in Palestine. Since 1917, when the question first arose, the Holy See has made known its attitude on the point and has repeated it in several formal documents. On June 13, 1921, the same Sovereign Pontiff pointed out that although he did not want to interfere with any rights of the Jewish people, neither did be desire to prejudice in any way the rights of Christians in Palestine. (A.A.S. Vol. XIII, page 283). The attitude of the Church was set forth in an “Aide Memoire” to the Council of the League Of Nations on June 4, 1922. A copy is attached to this letter. There is also a copy of a letter from Cardinal Gasparri under date of March 6, 1922. If a “Hebrew Home” is desired, it would not be too difficult to find a more fitting territory than Palestine. With an increase in the Jewish population there, grave new, international problems would arise. Catholics the world over would be aroused. The Holy See would be saddened, and justly, so, by such a move, for it would not be in keeping with the charitable assistance non-arians [sic] have received and will continue to receive at the hands of the Vatican. One cannot truly believe in ‘Issa [Jesus] and not believe in Muhammad (SAAW). To truly accept one Prophet or Messenger necessitates the acceptance of all those who came before him and all who will come after him, ending with Muhammad (SAAW). There is not enough information in the formula given above to classify it as a statement of logic. If the first "prophet" (1) warned of false prophets, (2) founded an authoritative Church to teach, (3)AND if that Church has taught from the beginning of its life on earth that there would be no new revelation, then the second prophet could not be accepted. To better understand the plight of Christian Arabs in the Holy Land, I recommend books by Fr. Elias Chacour available at Amazon.com. Current results from The Palestine Chronicle reader polls. Who is the Most Capable Individual to Lead the Palestinian People? The saints have always been the source and origin of renewal in the most difficult moments in the Church's history. OLD THUNDER: A LIFE OF HILAIRE BELLOC, By Joseph Pearce, Ignatius Press, was reviewed by James E. Person, Jr..
Merle Rubin reviews The Awakening by Kate Chopin. Rubin reveals an interesting irony about this book's popularity in feminist circles. This book is not recommended, but the review is worth reading. Kelly Clark has been doing a fantastic job keeping us all up to date about VOTF in her column The Lady In The Pew and the Lord knows I have enough to keep me busy without tackling something else, but I just have to say something about it. I can't keep quiet about it. I was reading this (sarc on) completely unbiased (sarc off) account by Steven Rosenberg in The Boston Globe this morning and it occurred to me that there is a KEY POINT that should be continually pressed home to those who may be soothed by the siren song of VOTF. If you will notice on their website VOTF has enumerated three 'goals' of the organization. These are (1)"To support those who have been abused". This is definitely a good thing. The second is "to support priests of integrity". This, too, is a good thing. Of course, a "priest of integrity" can mean different things to different people. There are those who believe that a priest who refuses communion to those who publicly advocate homosexual behavior is not a priest of integrity whereas others would marvel at his COURAGE (pun intended). For the sake of argument, though, I will give them that one and assume they are referring to priests who agree that pederasty in the Church should be stopped. Now, however, let us examine goal #3 which is "To shape structural change within the Church." WHOA!! WHAT??? Shaping structural change in the Catholic Church??? What could be more Protestant than that??? Laity changing the structure of the Church? "Shaping" means "changing", right? And what is the "structure" of the Church?? Why, we have a hierarchical church, do we not? Why would I want to turn it upside down and start looking at the universe through the wrong end of the telescope? It's a no-brainer. VOTF states on it's website that it's internal "working group" (Structural Change Working Group) is a nine-member (all laity) group working to "clarify church structures: 1) as they are defined, (2) as they actually function, and (3) as they ought to be" and then adds, "to fulfill the vision of Vatican II." Um, excuse me? For more information on this "vision of Vatican II" garbage, please see "I was robbed", by Leila Miller. For you progressives, you can rest assured that Leila's story is a FRESH look at OLD mistakes, one of which is a mischaracterization of Vatican II (i.e., application -- or rather MISapplication -- of "mandates" that cannot be found anywhere in the actual text of the council decrees). Oh!! I nearly forgot!! You must must MUST also read I. Shawn McElhinney's Vatican II and Authority for another good look at this "spirit of Vatican II" hogwash. PARDON MY CANDOR, but, you see, I am a convert, and we converts do not take kindly to a bunch of cradle Catholics who have little or no appreciation for what they have in the Catholic Church, starting up these little committees to subvert the very heart of those doctrines of the Church that we cherish so much that we have abandoned all to cling to Her. If they want to be Protestants, I say, let them start up their own church somewhere!! But do not start throwing rocks at the beautiful Bride of Christ simply because you think she has a little mud on her face. Okay, I've had my little spew about VOTF. Just one last thing, though. A Rev. Curley was quoted in that Boston Globe story (linked above) saying, ''I'm trying to work within the existing structure,'I think they're reinventing the wheel.'' AMEN, FATHER!! Amen. "Kingdom Not Bound by UN Resolution on Iraq"
Please consider taking this new poll about Voting and Mental Illness. See the beauty of Palestine at the online gallery of photographer Luke Powell. Is Ashcroft Opening A Pandora's Box?" "A horse, a horse. My kingdom for a horse." Reagan piped loads of money to the Mujahideen, you silly Ashcroft!! So, are we in the conspiracy to fund terrorism, too? Sheesh. Today we are observing the World Day of Mental Health, promoted by the World Health Organization. In her multifaceted commitment to the sick, the Church is always attentive to those affected by psychological disturbances. I assure these brothers and sisters of ours and their families a special remembrance in my prayer, and I encourage everyone who works at any level in this challenging field of health care. "Love is life. All, everything that I understand, I understand only because I love. Everything is, everything exists, only because I love. Everything is united by it alone. Love is God, and to die means that I, a particle of love, shall return to the general and eternal source." ~~~Leo Tolstoy (1828–1910), Russian novelist, philosopher. Prince Andrew, in War and Peace, bk. 12, ch. 4 (1868-1869). MADISON, Wisconsin (PC) - A mobile watchtower, lifted into the air by a crane, surveys Khan Yunis day and night. An ambulance from the city waits behind a nearby concrete building day after day; it waits so that the next child shot for playing too close to the wall can make it to the local hospital before dying. The wall is a vast, menacing construction stretching down the coast as far as you can see, separating Khan Yunis from the Gush Katif settlement block in the Gaza Strip. Israeli soldiers sit poised with machine guns in the cylindrical bunker at the northern edge of the wall overlooking the ruins they've made of the Khan Yunis refugee camp. Over there to the south and west, in the Jewish settlements, no one worries about water shortages or electricity outages. Families don't live in corrugated iron shacks unrecognizable as homes from the outside until someone points out what is supposed to be a door; until you see ragged clothing hanging up to dry above a parched piece of earth beside the shack. Parents in the settlements aren't afraid that their children will be murdered for absentmindedly playing too close to a wall. Their panorama is the buoyant, sparkling Mediterranean lapping the white sands outside their windows; an occupied view: for settlers only. There are children from the refugee camp playing in the shell of a building not far from the wall. A small Gaza girl eyed me with a dark face, suspicious but curious, the last time I walked this area. When I asked to take her picture she simply stood still with the same brooding expression on her face as I clicked the camera. A year later and here she is playing among the ruins; taller and longer haired but with the same knowing look. When she sees me she stops and we both flash a quick smile of recognition. She's not dead, I think. One cannot help but wonder this about those who go on living here. And now I wonder again about her and her playmates; about the men and women mulling about in the hot streets of the market. I wonder about the boy who was shot in the arm by a soldier in the mobile watchtower target practicecarried away by the ever-present ambulance just after I arrived to gape incredulously at the wall. I wonder about the boy who draped a Palestinian flag over his shoulders like a cape after the funeral of two others killed in the night by a tank. He ran past us to his home, a white apartment building with bullet holes and tank-blasted craters in the concrete decorating its sorry façade. Can it really be this bad? Can you expect people to keep listening to the morbid descriptions of life here without questioning your accuracy? Perhaps not, and yet the most striking feature of all is that it is so much worse than these paltry words can express. I've awoken to a most disturbing email message from a friend. "Massacre in Gaza" the subject heading reads. "Things grew very bad tonight in Khan Yunis. After an incursion into the refugee camp two people were killed and ten injured. A tank then stopped suddenly in the road and the Israelis started behaving in a crazy way, firing everywhere. A helicopter fired a rocket killing eight more people and wounding about 100. Later we heard that they were shelling the Nasser hospital in Khan Yunis. Things are going so much to the worse here." It's déjà vu in the Gaza Strip: more incursions, more firing, more dead, more dazed children, more grieving relatives, more wreckage in the wasteland of the Strip. I still tense up at the sound of airplanes flying overhead because of my nights spent in Rafah and Gaza City. Five months of listening to fighter jets, helicopter gunships, tank firing, machine gun fire, grenadesand the slightest "bang" now makes me jump. What are we turning a population of full-time inhabitants of this hell into?? My friend Ghada writes to me the next day, "The attack in Khan-Yunis was more than horrible. I went numb when I heard of it. The only thing I can say is 'what can we do?' We pray God to stop the Israeli madness soon." The signs aren't looking good. The specter of war in the region is looming. Talk of "transfer", of the forced expulsion of the Palestinians from the West Bank and Gaza, is gaining in popularity not only in Israel but also in pro-Israel circles in the United States. Members of Congress and of the Bush administration are echoing the most outspoken advocates of this policy in Israel, people like Effi Eitam in charge of Israel's settlements programs and an outspoken advocate of expulsionor General Eitan Ben Elyahu, former head of the Israeli Air Force who recently announced that "eventually we will have to thin out the number of Palestinians living in the territories." No one protested. Under cover of war, the Gaza girl with the dark eyes and her playmates, the bereaved family members of the recent massacre, the children at the kindergarten near where the Mezan Center for Human Rights office is, my former co-workers themselves Ghada with her beautiful English and hopes to study abroad, and Mais with her beaming 'good-mornings', and Anwar, the maintenance man, and the diligent Ramiz, Adnan, and Hazem, and the owners of the Matooq restaurant who welcomed me every time I came in for lunch, and the storekeepers and the taxi-drivers, the beggar-children and the women shopping for food they're all supposed to disappear, like chemical-treated stains. The juggernaut advances and there is blood on our hands. The oranges and olives will witness the last of the just the people I met who told me they would never leave Palestine. Will their deaths move us to open our eyes?